An artist’s book and a solitary walk through the exhibition The System of Objects, this publication consists of two slipcased paperback books that represent Dakis Joannou’s imaginative, inspirational, and unexpected collection of artworks, design pieces, and unusual architectural elements. 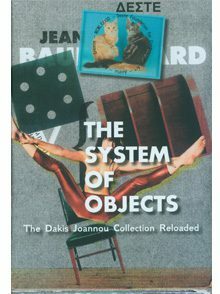 The System of Objects examines the pieces in the Dakis Joannou Collection within the framework created by French philosopher Jean Baudrillard in his seminal book of the same name. Each piece in the Collection was reimagined into one of Baudrillard’s four categories that incite object consumption: function, exchange, symbol, and sign. With an unprecedented combination of open areas, gangways, cages, black holes, and dead ends, The System of Objects is experienced by visitors as a labyrinth and a revelation. The installation itself represents an original experience due to several structural modifications on the building, making it a consistent and relevant part of the general concept of the project and empowering the presence of the pieces. 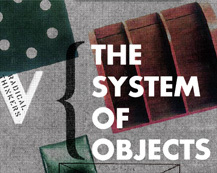 The System of Objects is a straight and complex representation of the restless, constantly growing visionary approach of a collector and his inventiveness.